We have received dozens of queries during last couple of weeks, many of our readers are worried due to fall in stock prices and inquired whether they should exit from their stocks in which they have invested in case market is expected to fall more. Mid and Small Cap stocks have beaten down since beginning of this month and investors who just started investing in stocks seems to be tensed due to their portfolio turning into red from green. If you think it’s the time to get out of stock market, you are wrong! Smart investors always invest when others are fearful and book profits when others are greedy. And if you are really worried thinking you have lost your money, remember that its a notional loss till you do not book it. If you have invested in fundamentally strong stocks with a medium to long term perspective, simply hold them. In fact, these type of corrections are utilized by smart investors to get into stock market. Time has shown that smart investors have made their fortune by investing in equities in long term. If you had invested Rs 1 lakh in Hawkins Cooker on 2 January 2004, your money would have grown to Rs 1 Crores and 8 lakh by now. Back then, Hawkins Cooker was a small capital goods company with a market capitalisation, or market cap, of Rs 14.5 crore and a stock price of Rs 27.50. It has been one of the wealth creators in the Indian stock market and given more than 50 per cent annualised return over the last 10 years. The company has a market cap of Rs 1,570 crore today while its stock is trading at Rs 2,995. Lets take another example of little known company Camlin Fine Sciences which is our 11-Bagger stock. We identified this Hidden Gems 3 years back and recommended it to our Hidden Gems members at price of Rs. 6.05 (adjusted price after 2 splits - from share face value Rs. 10 to 2 and recently from Rs. 2 to 1, actual recommended price was Rs. 60) and today it’s at Rs. 62 giving absolute returns of 926%. Moreover, its a 31-Bagger stock for investors who invested in it 5 years back. Company was trading at Rs. 2 (split adjusted price) with market cap of merely 19 crores in Feb 2009, today market cap of the company is 591 crores. Camlin Fine Sciences Ltd: Camlin Fine Sciences Ltd is one of the India's leading manufacturers and exporters of Bulk Drugs, Fine Chemicals and Food Grade products. The company manufactures active pharmaceutical ingredients (API's), food antioxidants and sweeteners. Company acquired subsidiary of Borregaard in March 2011 which was expected to help Camlin Fine Sciences in realizing better operating and profit margins in coming quarters. This acquisition ensured the easy availability of raw material Hydroquinone manufactured by Borregaard for Camlin Fine Sciences ltd. Company also introduced new products and continuously strengthening its marketing activities throughout Europe and USA. The scrip was trading at 4 X FY 2011-12 estimated earnings leaving good scope for stock price appreciation. Its very important to invest in right set of companies at right price with sound fundamentals. Its our mission to ensure that you reap the best returns on your investment, our objective is not only to grow your investments at a healthy rate but also to protect your capital during market downturns. We also take this as an opportunity to share the returns on investment given by one of our most admired service Hidden Gems, during last 2 years. Its a fact that 19 out of 30 Hidden Gems (Sept 2010 to June 2013) have given more than 100% returns to our members. Morever, 12 out of 19 have given returns in the range of 200% to 1000%. 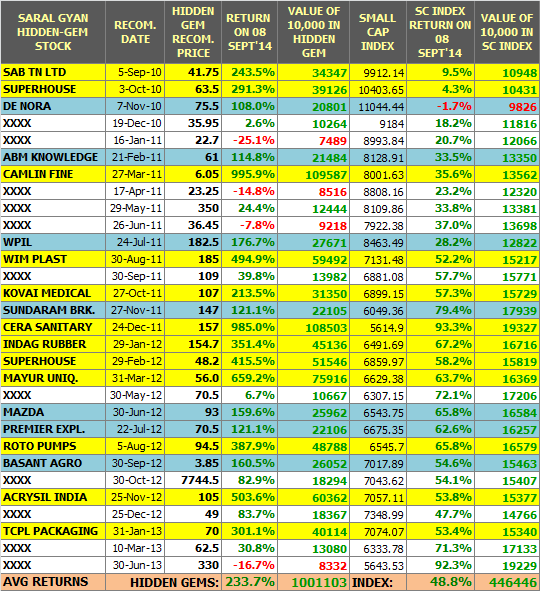 Below is the performance update of our Hidden Gems stocks since Sept 2010 vis-a-vis Small Cap index. Saral Gyan Hidden Gems is one of the most admired subscription service for equity investments in small cap stocks. Saral Gyan - Hidden Gems not only tops in performance giving fabulous returns to our members but also tops on Google search engine. Try it out yourself by searching "Hidden Gems stocks" or "Multibagger Small Caps", you will see our website featuring on 1st position. Hidden Gems & Value Picks 2014 Performance Update - Click here for details. Now you can add power to your equity portfolio by investing in best of small & micro cap stocks - Hidden Gems and mid caps with plenty of upside potential - Value Picks. Below table indicates our services and annual subscription charges, simply click on SUBSCRIBE! link to subscribe online using your debit / credit card or net banking facility and we will activate your subscription within 24 hours! 15% @ 90 DAYS Rs. 2500 / $ 50 SUBSCRIBE! Value Picks Rs. 5000 / $ 100 SUBSCRIBE! Hidden Gems Rs. 7500 / $ 150 SUBSCRIBE! Wealth-Builder Rs. 15000 / $ 300 SUBSCRIBE! Hidden Gems + Value Picks Rs. 11000 / $ 220 SUBSCRIBE! 3 in One (HG + VP + 15P) Rs. 12500 / $ 250 SUBSCRIBE! All 4 in One (HG + VP + 15P + WB) Rs. 25000 / $ 500 SUBSCRIBE! Subscribe to Hidden Gems & Value Picks and start investing systematically. Avail attractive discounts by subscribing to our combo packs, click here for details. You can subscribe online, simply click on Subscribe! link of the subscription service you would like to subscribe. To know about our other payment option and bank details, click here. 1. Saral Gyan eBook - How to Grow your Savings? worth Rs. 599. Not everyone has the time and inclination to analyse stocks and be able to identify potential wealth creators. If that’s the case for you as well, don’t fret. Choose our services and invest in good quality stocks yourself, that outperform the benchmark consistently over a period of 5-10 years and put your money at work. The strategy remains the same — identifying wealth creators and investing in them for long term.